The printer’s use has seemingly been mechanical, assisting with engineering parts more than anything else. But now a Dutch design graduate and amateur chef has created a way to sustainably print food snacks. The first 3D printer was invented in the early 1980s, with the creator designing a tiny cup capable of serving as an eye wash device. Since then, inventors have printed everything from spacecraft parts to prosthetic limbs and even a Pokémon phone case. The printer’s use has seemingly been mechanical, assisting with engineering parts more than anything else. But now a Dutch design graduate and amateur chef has created a way to sustainably print food snacks. Elzelinde van Doleweerd worked with a Chinese technology company, 3D Food Company, to create the 3D printed snacks from leftover food waste. One third of the food produced worldwide is wasted. One whole third. Those bits you leave on your plate, that courgette you forgot about at the back of the fridge or the piece of toast you accidently burnt. All those leftovers are thrown away and add up to an unimaginable amount of waste each year. 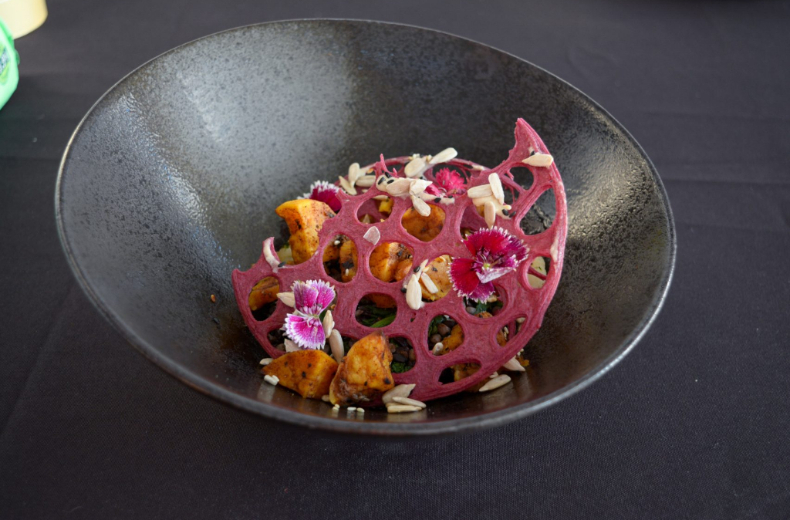 Van Doleweerd’s project transforms discarded food into beautifully designed and shaped snacks including lattice shaped, cracker-like samples made from purple sweet potatoes and rice. Her focus is on the beauty of the food as well as its sustainable nature. The innovation is part of van Doleweerd’s Upprinting Food project, which she began while at university. Previous iterations of the project have seen her work with common Dutch waste foods like stale bread, banana peel and vegetable ends. For this Chinese collaboration, van Doleweerd’s new concepts use leftover boiled rice to create the printed food paste. The waste ingredients are mixed together with eggs and butter acting as binding agents and then the printed paste is baked. Once baked, the pastes are dehydrated to ensure that no bacteria is harboured in the food. This is then used to make various snacks. With a growing population and shrinking landmass, we can look to innovators and designers who are creating food from what we already have, rather than using resource, time and space to grow something new. Visit Elzelinde van Doleweerd’s website to find out more.